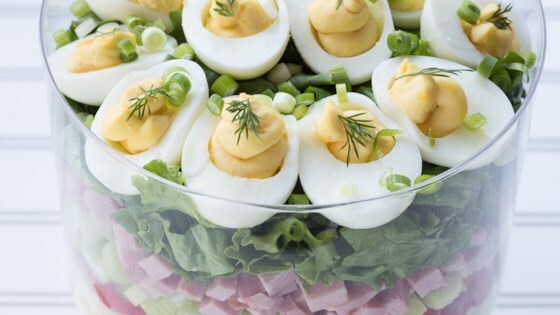 "This layered deviled egg salad has a little taste of everything and looks divine. Use a set of tongs to serve." Place eggs in a large saucepan and cover with cold water. Bring water to a boil. Remove saucepan from heat; let eggs stand in hot water for 10 minutes. Immerse eggs in a bowl of ice water and let cool, 1 to 2 minutes. Peel eggs and halve them lengthwise. Scoop yolks into a bowl. Arrange egg whites cut-side up on a plate. Mash egg yolks into a crumbly paste with a fork. Mix in 2 1/2 tablespoons mayonnaise and mustard with the fork. Season with salt and pepper. Spoon egg yolk mixture into a small piping bag; pipe into the egg whites. Garnish with fresh dill. Bring a large pot of lightly salted water to a boil. Cook bow-tie pasta at a boil, stirring occasionally, until tender yet firm to the bite, about 12 minutes. Drain and let cool, about 15 minutes. Mix cooled pasta with 2 tablespoons mayonnaise in a bowl. Season with salt and pepper. Spoon pasta into the bottom of a large glass trifle bowl. Layer tomatoes, celery, ham, and lettuce on top. Arrange deviled eggs on top before serving. Garnish with spring onions. Deviled egg-topped layered fresh salad! This is something I am going to make for Christmas, yummy!! !